Below are some general guidelines for band usage. Are best for general conditioning, rehabilitation, jumping, speed training, aerobics, and for lifters as assistance for the upper body to increase the resistance for biceps and triceps. Either band is great for beginners and light weightlifters. Both can be used to safely increase the intensity of a workout without adding additional weights to a bar. For the stronger lifter, they will add considerable resistance to bicep and tricep exercises. Can be used by stronger benchers, and with exercises involving the lower body, calves, quads, hamstring and glutes. These bands are also good options for mobility and stretching. Are usually used for obtaining maximum resistance with squats, deadlifts, leg presses and shrugs. The bands are 41 inches in length. Rogue Monster Bands is rated 4.9 out of 5 by 200. Rated 4 out of 5 by MeMyself from Great bands - but don't depend on the resistance I have a blue, a green, and a black band and I love them. However, as mentioned in some of the other reviews they don't provide as much resistance as described in the description. 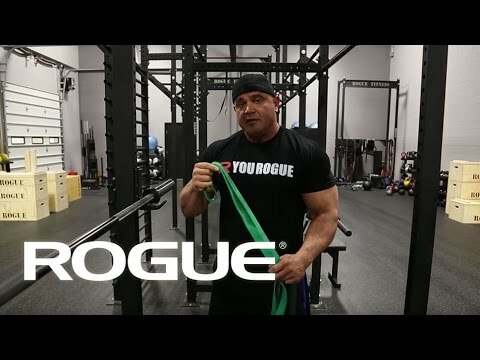 For example, the green band is described as providing 65lbs of resistance, but when I loop it over my pullup bar, a 45lb plate will stretch it to double its original length. I don't care a whole lot - I use the different bands for different things, and they provide adequate resistance for my needs... but if for some reason the exact resistance level provided by the bands is important to you, be careful and test them yourself. Rated 5 out of 5 by Kake from Dear EPIL The bands are elastic, so no matter how much weight you add it up too, as the bands start to return to their resting state, the amount of force they will apply on you when doing the pull up starts decreasing. The maximum amount of force will be applied to you at the bottom of the pull up and gradually decrease the higher up you get, thus making the top portion of the pull up harder than the bottom. Rated 5 out of 5 by Jake Fernandes from Try before you buy I love these things, let me get that out first. Incredible bands, strong, long lasting, quality product. My advice for anyone buying them is to attempt to try out some rogue bands prior to your purchase. I bought 2 pairs of green bands and 2 pairs of black bands. I use the black bands and one pair of green bands for out DL Platforms and the other green for mobility work. I am 6'4'' and 300 lbs. 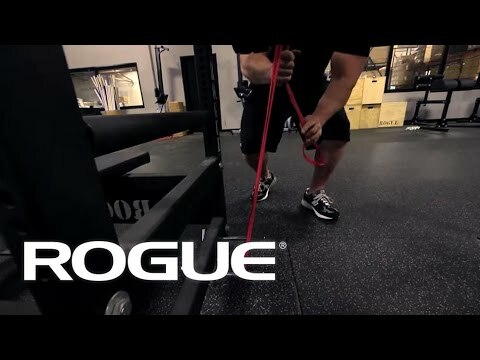 Matt Chan is using the black band for mobility in the picture, I don't know if this is a prototype that makes it a different color but there is no shot of doing mobility work with a black band, they're crazy strong. I have nothing negative to say about the bands other than the funky smell that doesn't seem to go away, other than that they're awesome, just be careful before you buy. Rated 5 out of 5 by Mark27 from Good product, better service Purchased 2 green, 2 black, and 1 blue. After a couple months of light usage, I noticed one of the greens had frayed. I contacted customer service and provided pictures; they got a replacement sent out almost immediately. The bands themselves are great for mobility, stretching, and adding a new layer to existing lifts. Rated 5 out of 5 by KellyT from Great for pull up assistance I bought the green band to improve my pull ups. I am a mid 20s Woman and have constantly been stuck on just being able to to do two pull ups. With this band hung from my pull up bar I can get more reps in and it has increased the number of un assisted pull ups I can do. I've found that the green band is pretty equal to the assistance you would receive if a buddy was helping you with your pull ups, and you can change the amount of assistance by putting your foot through the band for more assistance or just using one knee for less. So far no issues, I accept the fact that the more I use it the more it will probably get stretched out and provide less assistance, but that's okay! The point is to use the thing and if it gets stretched it means you're at least putting in work! Well worth the improvement to your pull ups. Rated 5 out of 5 by MattS from Provides Additional Training Options We originally purchased these to help with flexibility and to assist my wife on being successful with pull-ups. After doing some additional reading we quickly found out how much additional value they could provide in other areas. For example, we have started using to provide just the right amount of additional force when locking out on the bench press. We started with some of the smaller resistance (#1 and #2) bands. The length of the band we find to be ideal and easy to modify how they're attached to fine tune the appropriate amount of force. I would strongly recommend and will likely purchase additional bands as additional resistance is needed. Rated 5 out of 5 by Tara from Super Necessity I had no idea the kind of mobility exercises you could do with these bands. I am addicted! I bought the Black band which I love and is very versatile but I think I also need the Green and either the red or blue. Don't skim on these, go big and get 3 to start, you'll cover all the bases and save on shipping. Rated 5 out of 5 by Eric Trinque from Perfect items, great prices So I grabbed a few different bands, red set, 2 mini blue, and 2 mini green, along with a set of gray rogue wrist wraps, everything arrived fast and well packaged, all the products were out of the box perfect and all performing excellently. I have been using the band's on off days for active recovery work and before training for general warmups and getting some blood moving, they are an awesome tool to add to your arsenal for both pre/re-hab and for a quick work out when you just need to get lose and moving. The wrist wraps are awesome and I have been putting then through the paces each and every workout and they have not shown any signs of breakdown or lose of elasticity. Really looking forward to getting some more gear, knee wraps, elbow, weight belt. 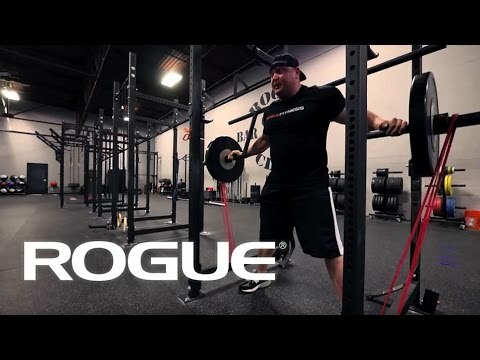 Rogue is the top of the class for a reason and their products and service really prove it.